GAND, Belgium – A first cautious analysis seems to indicate that the European bicycle business has held out relatively well in 2008 … despite or thanks to the economic crisis? Mainly the low end sector has been hit. Last year, the extra-European import (from countries not in the EU) stagnated in volume at 9.44 million units but grew in value by almost 9% to an overall average of € 88 per bike, as opposed to € 80.60 in 2007. In the top ten of non-EU suppliers there were no spectacular changes, only a few shifts. The imports with the lowest value all lost volume last year: Tunisia -4.3%, China -6.1%, Malaysia –28% and The Philippines -35.8%. This seems to corroborate the fact that the crisis is mainly hitting the low end of the market. The only exception to this rule was Sri Lanka. Despite an average value of only € 44.15, the volume increased by almost 1/4th pushing the country from 6th to 4th position. That may well be due to the fact that Sri Lankan imports are completely exempted from duties. Taiwan still remains the unbeaten leader of the import ranking. Last year, imports increased once again with almost 8% to 3.34 million, whereas average value gained 2.7% to almost € 135. Cambodia also booked strong results. An 11% volume increase took the country to 7th position, while average value went up by more than 12% to over € 90. After a year of slight decrease, the intra-European import (between EU member states) recovered and went a little beyond the 2006 result: 8.245 million compared to 8.23 million in 2006. As a result total European bike imports amounted to 17.685 million, which is only marginally better than the year before. With that extra-EU imports had a majority share of almost 54% against + 46% for intra-EU imports. The results vary considerably from member state to member state. Of the ‘old’ member states, 10 imported more bikes than in 2007, whereas 7 imported less, i.e. Italy, The Netherlands, UK, Spain, Portugal, Ireland and Cyprus. Of the ‘new’ member states only in Estonia and Latvia total imports shrunk. In the 8 remaining countries imports rose, in some cases quite considerably: Czech Republic +17.5%, Romania +33.3% and Poland +44.3%. Apart from Estonia, Slovakia and Lithuania, all new member states have sold more bicycles to their fellow member states last year. Poland and Bulgaria made the biggest leap forward. As a result, Bulgaria pushed Lithuania from second position in the new member states’ ranking. In the main, average value has gone up, in some cases quite a lot, for instance +14.4% for Poland and 8.5% for Lithuania. Bicycles from the Czech Republic and Hungary have a remarkably high average value; € 195 and € 192 respectively. 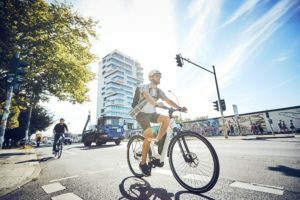 This could be contributed to the fact that in both countries bike facilities are located which cater for the high-value Dutch and German markets. The Accell Group facility Hunland is based in Hungary which recently produced its 1,000,000th bike. In the Czech Republic Bike Fun International is based, a 100% Dutch owned company that exports the biggest part of its production to the Netherlands, Belgium and Germany. Germany and France are without any doubt the best customers of the bicycle manufacturers in the new member states. France is a major customer of Poland and since last year also of Bulgaria. Imports from Bulgaria rocketed from 868 in 2007 to almost 97,000 last year. Germany is a major customer of all the countries in the ranking. Furthermore, Lithuania also has relevant exports to Latvia, Hungary to Finland and Bulgaria to Greece and Belgium. The Czech Republic supplies a considerable number of bikes to Austria, Belgium and Slovakia. It is too early to draw conclusions on European-wide sales for 2008. However, the results for some key countries are available and these already reveal some trends. In Germany sales volume shrunk by 6% but the average value of the bicycles increased from € 367 to € 386. Consequently, the total market only lost 1% of its value and reached € 107 billon in 2008. The rise of the average price is mainly contributed to growing sales of electric bikes, which achieved a market share of 2.5%. 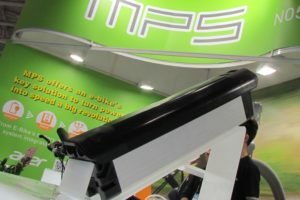 The industry association ZIV believes however that the growth in e-Bike sales will slow down from +62.5% in 2007 and +54% in 2008 to an estimated +20% in 2009. However, that slow down is contradicted by Accell Group’s big growth in e-Bikes sales in Germany during the first half year of 2009 (for more see page 14). Another significant phenomenon in the German market last year was a shift in distribution. Food and DIY markets lost 4% market share for a total of 30%. The IBDs achieved an increase to 63% share in volume and 80% in turnover. The same happened in The Netherlands where IBDs pushed their market share from 74% to 81%. 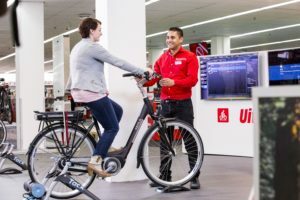 It seems that the booming E-bike business mainly benefits independent dealers because they are better at offering the level of information and service, which this product requires. Last year, in Holland, almost 140,000 E-bikes were sold at an average retail price of € 1,900. They brought in 1/3 of the revenue from the sale of new bicycles. Nevertheless, total bicycle sales in Holland dropped by + 1% to 1.388 million. They were sold at an average of € 688. Just as in Germany and in Holland, the French sales volume decreased by 3.5%, whereas turnover increased by 1%. Although bicycles for recreational use still have the biggest share (68%), their sales volume dropped by 6%. On the other hand, sales of bicycles for utilitarian use increased by 4%. 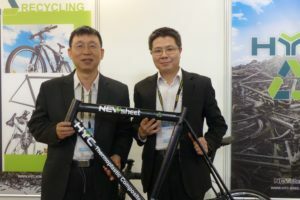 The volume of e-Bike sales is still limited, 15,800 units, but that is nevertheless a 50% improvement of the 2007 result. As for bike distribution, France also shows a similar trend as Germany and Holland. Whereas sports chains have the biggest share in sales volume, IBDs have a majority share of 53.5% in turnover. In the UK, bicycle distribution develops in a slightly different way. Bike dealers seem to choose more and more for joining organizations, rather than staying on their own. As a result Raleigh’s franchise formula, Cyclelife, for instance is doing well. In April 2008, the 100th member joined whilst the objective is a network of 200 shops. In the past 5 years, IBD chain Evans Cycles grew to 31 outlets. In order to fund further expansion, the group attracted Active Private Equity as a major stakeholder. UK bike sales benefited from soaring petrol prices and the effect of the excellent results of the British cyclists at the Olympics. Still, in the last quarter of 2008, turnover was badly affected by the economic crisis and by petrol prices returning to normal. The future of the bicycle in Eastern Europe looks bright. A growing number of brands make the offer more attractive and cycling becomes popular both as a sport and for commuting. Expectations are that shrinking purchasing power following from growing unemployment will stimulate the interest in the bicycle as a means of transport. An increasing number of cyclists will without any doubt add pressure on local authorities to build cycling infrastructure. A good example of this development is the critical mass movement in Budapest. Every year on Car Free Day or on Earth Day the movement organizes a ride through town. The first event in 2004 attracted 2,400 people, in 2008 the crowd had grown to 80,000 people among whom the Hungarian President. National and local governments have subsequently allocated budgets for cycling infrastructure. For three years in a row, the number of people using a bike on a daily basis has doubled in Budapest. The political support for cycling in Budapest is just one example of a clear trend of public authorities throughout the EU stimulating cycling in their fight against pollution, traffic congestion, climate change, bad public health, etc. There are many more examples. In cooperation with the German Energy Agency, the German Environment Ministry has created “Effizient Mobil”: a € 3.8 million project to reduce traffic emissions in 15 regions. The main objective is to create a network of organizations and companies that develop transport plans aimed at encouraging their employees to swap the car for public transport and for cycling (www.effizient-mobil.de). Furthermore, the German Ministry of Education and Research has made € 700 million available to make Germany in the next 10 years the leader in the field of electric mobility. It is not clear whether this programme only focuses on cars or also includes electric two-wheelers. In Holland, the Ministry of transport has launched a new programme to improve the capacity and quality of infrastructure, road safety, information and education. But strangely enough, the government continues to refuse the inclusion of electric bikes in their fiscal incentive scheme. In this respect, Belgium is for once one step ahead of Holland. New legislation has increased the tax-free allowance for cycling commuters to € 0.20 per km and has indexed it. Employers can give their employees a(n) (electric) bike, tax free and without a limitation on the price of the vehicle. The employer can also compensate the employee for parking and maintenance costs. In France, government has not yet fully grasped the benefits of stimulating cycling. Earlier this year, new measures for the reimbursement of commuting were introduced. Since, employers have a legal obligation to pay back at least 50% of the subscription fee for public transport or for rental bikes. Attempts by the cycling lobby to include an allowance for commuters who use their own bikes were laughed off by the ‘deputes’ as ridiculous. And yet, the Belgian example proves that paying for cycling does work. 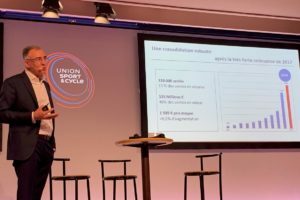 Research by the Belgian mobility department has shown that if a company pays the allowance, cycling increases. The number of cyclists rises from 6.3% to 9.5%, that is +50%. Another measure that definitely stimulates cycling is charging motorized transport as was proven in a spectacular way in London. Still, the congestion charge was not introduced with a clear intention of boasting cycling. Today the London mayor is trying to catch up with the cyclists’ boom by means of a 6,000 bike hire scheme and cycling corridors providing commuters with fast and easy access to London.